According to news reports in early April 2014, a cemetery park in Laishui County, Hebei province, has been marketing graves for around 60,000 yuan per square meter, saying the plots have ideal “dragon contour” positioning according to the art of fengshui, or geomancy. The prices for these grave plots were about 15 times as high as the local price for price real estate. News media also reported that the registered legal representative of the company that runs the cemetery park is the deputy head of the local civil affairs bureau. 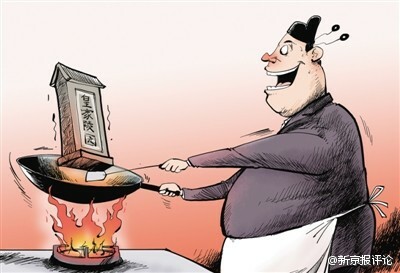 In the above cartoon, posted by The Beijing News to Sina Weibo, a local official cooks a gravestone over an open fire, a reference to cooking up prices.